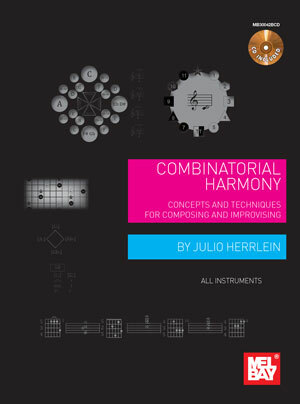 COMBINATORIAL HARMONY – CONCEPTS AND TECHNIQUES FOR COMPOSING AND IMPROVISING (BY JULIO HERRLEIN) is a unique and complete system for exploring endless musical possibilities in any style. This book is a must for the contemporary musician. Despite being a guitar-friendly book with a complete mapping of the fretboard, the book is also useful for improvisers, arrangers, composers, theorists and students interested in the combinatorial approach to music. About 1,000 different voicings in all positions and drops are presented, including complete 3-note and 4-note voicings with specially designed guitar diagrams. The book also includes all triad-pairs (hexatonics) and their combinations in melodic exercises. The book presents brand new “combinatorial voice-leading”, for 21st century chorale writing and contrapuntal exploring for any instrument or arrangement. In 312 pages, the book provides a vast store of material for compositional and improvisational use. What we see in this book is heavy artillery! Valuable information, deeply detailed and illustrated in order to bring both the student and the experienced musician the opportunity to experience harmony and all its combinatorial relations in a logical and effective way. A good tree is one that produces good fruit, and the musical examples presented by Julio Herrlein in this book prove that. The tasteful exercises in this book demonstrate the genius of this virtuoso guitarist, who has now generously shared with us his knowledge. The basic idea of the book Combinatorial Harmony is to be a catalog of possibilities. In the work, Julio does not deal with specific styles and the students will use the book as they feel the need to apply in their own music, some of the ideas presented in it. “As a guitarist for over twenty-five years, I have always been interested in how I could use these hints on my instrument. Currently, there is a great tendency for the use of intervallic phrasing in improvisational music, based on specific combinations of sounds, modes of limited transposition and other techniques such as hexatonics (six-note sets). During the preparation of this study, all three-note and four-note sets have been mapped with their possible usage as harmonic function. Furthermore, this mapping includes fretboard diagrams for acoustic and electric guitars and practice exercises to memorize these patterns. I have also attempted to turn the hard musical set theory approach into something easier, presenting “friendly” denominations for the note sets using Chord Typology”. (Julio Herrlein). The book has 312 pages and a CD included. It have a foreword by Nelson Faria, a pioneer in the field of guitar publishing in Brazil and reference as a guitarist; with executive produced by Luciana Etchegaray.